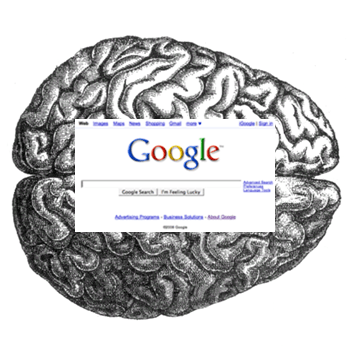 There’s no denying that Google has a hold on us, but new research reveals the depth to which our brains have been augmented by the use of search engines. A group of researchers has written a study that examines how this immediate access to a database full of information we need and want has altered the way we use our memory. Google Effects on Memory: Cognitive Consequences of Having Information at Our Fingertips published by Science examines some of these results. Most specifically, people can’t use their memory as well to pull up information, but we have the ability and knowhow to find it on the Internet. Basically, the team tested this theory first by giving participants information. For some pieces of information, they would be told it could be found using the Internet, and others could not be. People were less likely to remember the data that they knew could be found via the Internet (see Columbia’s press release for a more thorough understanding of the experiment). Part of the test also involved telling participants that information was stored in certain folders, and researchers found their subjects could remember the locations of the data better than the data itself. So are the likes of Google, Bing, and Yahoo making us stupider? Not necessarily. If you choose to look at the positive side of this study, it simply means that we’re choosing to use different skills. We choose to use search engines because we know how to utilize them to find the results we want, preferring this over exploring the archives in our brains alone. This is just like the student who couldn’t remember what precisely happened in chapter five, but knew if he pulled out a book and turned to pages 100-150 he could re-access the answer. We’re becoming more adept researchers, but in essence creating lazier brains. And given the widespread adoption of smartphones, why would we waste time pushing our minds when we know we have endless platforms with the answers quite literally at our fingertips? Of course, poor memory can be linked to some negative effects, including Alzheimer’s disease. Hopefully this just means we will continue to stretch our brains, just in a much different way than before the search engine.